When -ess is added to a noun ending in -tor, -ter, the vowel before r is generally elided (eliminated or left out), as in actress (actor + -ess); and such a derivative with the ending -tress (often equivalent to French ) is usually considered a reduced form of Latin -trix, -tricem and popularly regarded as the equivalent of -tor + -ess. In Middle English many words in -esse were adopted from French; such as, countess, duchess, mistress, and princess, or formed on nouns in -er; such as, enchantress and sorceress. The H.W. Wilson Company; Bronxville, New York; 1988; page 343. The suffix -ess is diminishing from English usage, with trends or tendencies toward avoiding any unnecessary references to gender or sexual categorizing (feminine or masculine. The suffixes -er and -or are no longer gender-specific in modern English: an author or manager, like a doctor or writer, may be male or female, so the words authoress and manageress are considered redundant. Some -ess words remain in use; for example, heiress and actress, although actor is being used more often now for both men and women. 1. A woman who is a peer. 2. The wife or widow of a peer. A woman who is in charge of a mail delivery service establishment: Pam's sister worked as the postmistress in the post office in her small town. 1. A nun in charge of a priory or ranking next below the abbess of an abbey. 2. A religious house governed by a prior or prioress, often dependent upon an abbey. 1. A woman who speaks by divine inspiration or as the interpreter through whom the will of a god is expressed. 2. A woman predictor or a woman soothsayer. 3. The chief spokeswoman of a movement or a cause. 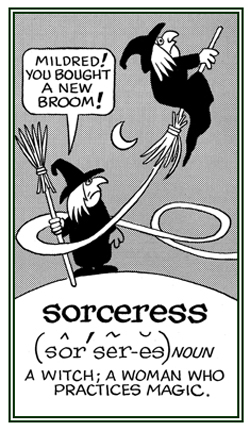 Usually a woman who practices witchcraft: The common image of a sorceress is of an old woman with a crooked hat, a long nose, a broom, and a black cat and who can use magical powers that are believed to be obtained through evil spirits. © ALL rights are reserved. Unworthiness by virtue of lacking higher values; baseness, contemptibility, despicableness, despicability. Showing page 3 out of 4 pages of 50 main-word entries or main-word-entry groups.